thanks @fluffypillow for your clear explanations. I did learn something! Indeed after the replacement of every "&" characters it's all fine. Therefore I'm now using your frontend as default. Do you mind if I share some further issues/feedback in this space? Mixed cases/boxarts. Sounds like cropping is the straightforward answer here. Perhaps for some cases you can rotate them left or right and on hovering rotate them back to their original view. Not sure I'm clear but anyhow it shouldn't be a good fit for all cases. For SNES the Japanese covers will need cropping as rotation here won't help. Sound. Depending on video snaps/previews sometimes sound can be low/loud. Any chance to have an option to control sound volume? Even better would be a volume limiter to not go above a specific level. Marquees. Despite having them in my ES2 gamelist.xml files they don't show up. I'm using tag <marquee> and all files are present. Not sure what's going wrong. Players count. Like #3. I have the <players> tag in my ES2 xml but nothing show up in Pegasus. Genre. Same as #3 and #4. The <genre> tag is there but none appears in Pegasus. Rating. Same as #3, #4 and #5. Video previews. Possible to play these only once? To have an option to play them in a loop or not would be nice. Fullscreen. I'm not sure but it seems that Pegasus UI is a bit zoomed-in. The selector on top with the different systems looks a bit cropped. It might be just an impression but definitely the systems selector on top doesn't look the same as in your preview from your 1st post. I didn't have any screen issue with ES2. Logos. In the logs (lastrun) I can see that "mame-libretro" and "pcecd" are not recognized hence their logos don't show up in the systems selector. For "mame-libretro" I'm not sure as I'm using standard from Retropie I guess if I rename everything with "mame" it should work but that sounds a bit tedious :) For "pcecd" this is a system I've added myself and I'd be happy to have a logo for it as well. It's the PC Engine CDROM. Favorites. I'm not sure where the favorites are located. I can see a favorites.txt in the Pegasus config dir but that's all. To have something similar to ES2 where you have a "new" system created with your favorites games listed would be nice. On-sceen help. I was a bit lost without indication the first time I tried the frontend. To have some indications in a form of a bottom bar like ES2 where various buttons+description would be nice. I was always hitting the "start" button of my X360 controller to access the options screen (I'm used to ES2 definitely!) but with Pegasus this button launches the games! Such help would ease the transition from ES2 to Pegasus. Jump-to-letter and filters. Not sure how to use these. The "Y"/yellow button on my X360 does nothing. Updates. 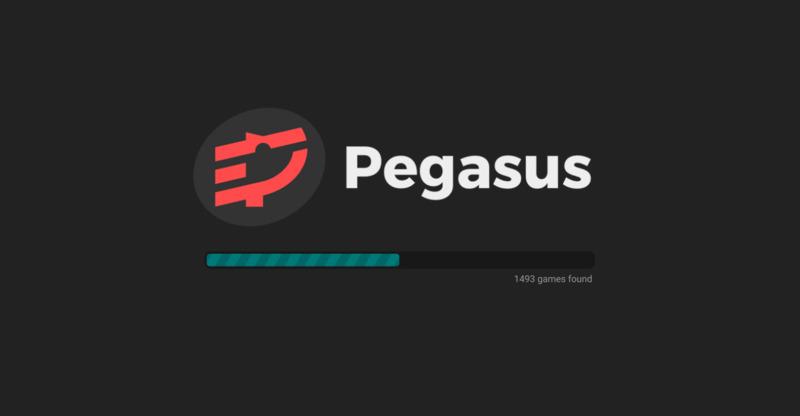 I'm using Retropie and I can only update Pegasus "from binary". Not sure how to get the latest release with your latest commits. For instance how to get the playtime tracking you just added on week 67? Hidden tag. I'd like some items from gamelist.xml to not show up in the UI (eg. bioses). I'm using the <hidden> tag today but perhaps there's another way to do that. Games order. File name sorting is working. Awesome \o/ However I do see weird ordering on some occasions. For instance, Gun Force 2 (Geo Storm) is sorted before Gun Force: Battle Fire Engulfed Terror Island. Or Macross II (Super Dimension Fortress) before Macross (Super Spacefortress). Another example would be with the Street "Alphas" where Street Fighter Alpha: Warriors' Dreams (Street Fighter Zero) is sorted last after Street Fighter Alpha 2 (Street Fighter Zero 2) and Street Fighter Alpha 3 (Street Fighter Zero 3). Last example with SF3 same as SFA you've got Street Fighter III: New Generation after 2nd and 3rd Strike. These are the actual names I'm using in my gamelist along with the tag <name>. I don't mention it because I know this is rather complicated but the Mortal Kombats are not sorted properly as well. I suspect this is due to the II(double i) instead of a number in the title. Perhaps something could be done by mixing name with release date together? That way you're sure Mortal Kombat II can't be listed after Mortal Kombat 3. Not sure it works for all situations though. List wrap. Would it be possible to get back to the top of a game list after pressing the down button from the controller? I mean whenever you get to the bottom of a list (and some lists can be huge like NES with 1000+ games) if you want to go back to the very top of it the only to do that is pressing the trigger several times. It can be tedious with larger lists. In ES2 after launching a game if I press quickly on a button ("X" on X360) I can reach out a "debug" screen where I can change some parameters like emulator type/name, showing games covers, resolutions, etc. Is it a feature of ES2 or something else? I'd be happy to have something similar in Pegasus. My use case is as follows. There are several MAME versions out there and some games work better with a specific version than other. Whenever a game requires a specific version other than the default "lr-mame2003" I launch this game then hit the "X" button. Finally I do select a specific MAME emulator I'd like to use for that game. I can then see the game and emulator are then added to the emulators.cfg file under Retropie > configs > all directory. Thank you again for making this really great frontend. All videos are played on the system's volume level by default. While it'd be certainly possible to write an audio normalizer, unfortunately I'm not an expert in this topic to implement such a feature. I think FFMPEG or similar video editing tools could help with this, however. 3-4-5-6. These properties are detected from the ES files, but currently aren't used in the default theme. They might be in future! Yeah that bar might be a bit too slim (especially on small screens), I'll see if making it bigger would look better. As for the fullscreen, if you see the whole logo for the system, then it's OK, Pegasus itself shouldn't crop the screen. Yes, the main theme only has image for mame. I'm not familiar with MAME, does this libretro version have a separate logo in RetroPie/ES? As for PC Engine, there's a logo for pcengine, would that be good or the CD version has a different logo? You can find the currently recognized names here, if you have some nice vector images, I can add them. Yes, they are stored in favorites.txt, and you can use the filter panel (Shift/PS-Triangle/Xbox-Y) to show only your favorites -- except opening this panel apparently broken using the gamepad, and I forgot to fix it. Other than that, the separate collection approach could also be done, it's just not implemented yet. Yeah I really want to add some kind of first start setup/tutorial screen, and also a help screen in the menu. I think the main theme would be a bit cramped with yet another bar, but other themes are free to show the controls. RetroPie always downloads the latest release, as soon as it's available. There might be a separate stable/latest option eventually, but I still want to improve Pegasus a bit before that. I also plan to add an update checker eventually. Yes, they're sorted by file name, but they indeed should be by title. Will fix it in a minute. I've added #14 and #15 :) Thank you for the responses. It's clear for me now. Sounds good. Actually if you can find a way to pause/start video for people with only controller (like me!) that would be great. Perhaps a controller button can be assigned or you can hover the video and click on it with "A"/select button. It should be the same mame logo. It's called mame-libretro to make difference with the various versions included in Retropie (eg. mame-mame4all, mame-advmame, etc). All these should be assigned the mame logo. For PCE CD it does have a different logo. You can get one here or here. @nemo93 also added #14 and #15 :) Thanks for the repo link, will check it out.